Drive into Salt Lake City- 10 miles of downhill! Monday morning Gizmo was feeling better and we were ready to get on the road again. We were planning to break the upcoming 1100 mile journey into 4 days with the first stop in Rock Springs, WY. It has been a week since we had to hook up the car and pack everything away securely so we were feeling a little “rusty”. We took our time and double checked everything before heading out. We were feeling good as we left as all had gone well with the hook-ups and we were underway for a “good travel day”. We even had dinner in the crock pot simmering as we drove. We set the GPS to take us to Rock Springs and we were very surprised it did not take us out to I-25 but instead routed us up through Fort Collins. We decided to trust the GPS as it had not steered us wrong yet. John was pleased because the route brought us through Fort Collins and right beside New Belgium Brewing. He parked the RV with car in tow on the side of the street outside New Belgium and ran in for one last growler refill. The day was only getting better as it was Growler Monday which meant refills were just $5.47. I cannot tell you how much we love our Garmin RV GPS. It routed us from Fort Collins up Rte 287. This was a great bypass of I-25. It was an easy drive that was scenic and not crowded. 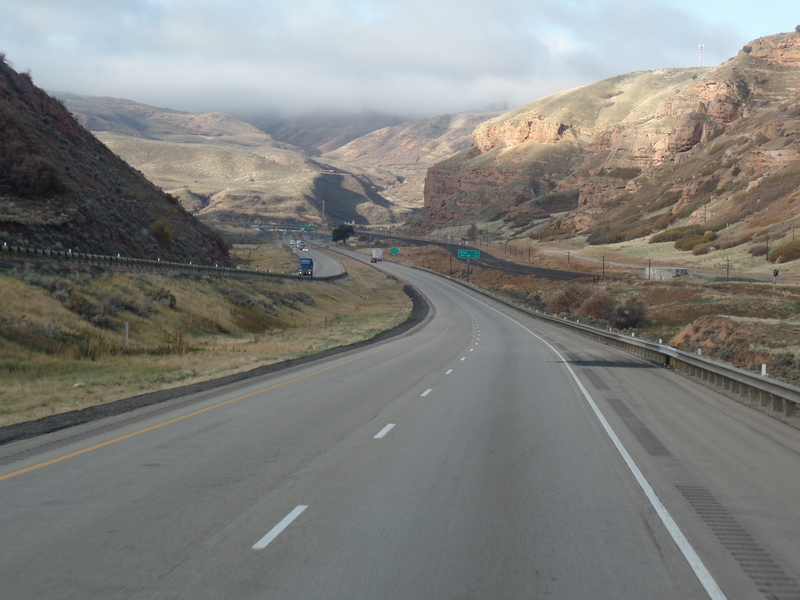 The route brought us into Laramie, Wyoming and back to I-80. The weather was overcast with off and on brief showers. The wind was substantial with gusts upwards of 40 MPH. The day was going well and we were about 6 hours into our travel day when we heard 2 long beeps. We both looked at each other and said, “what was that?” John looked at the instrument panel of the RV and all was fine. We were puzzled. Then we decided it was the crock pot letting us know the meal was done. A few minutes later we heard the 2 beeps again. I jumped up and ran back to the crock pot. It still had over an hour left, so it was not the source of the beeps. John said, “do you think it’s the brake system in the car”? All looked fine in the camera looking back at the car. We decided we had better pull off to the side of the interstate and check things out. We found out it was the braking system in the car. The cable connecting the car and RV had jiggled loose but did not disconnect completely, most likely due to the high winds. I was pretty shocked that such an important alarm could be intermittent and not sound critical. We gave the brakes some time to cool off, reconnected everything securely and got under way. We knew we would have to check the car out later when we arrived at our destination for the night. We arrived at Rock Springs, Wyoming around 3pm and decided it was way to early to stop for the night at a Walmart. We decided we would continue on to Evanston on the western border of Wyoming. We arrived at Evanston just before sunset and found a parking spot for the night in a very popular Walmart. We disconnected the car and took it for a couple of spins around the parking lot and all appeared normal. The car is definitely getting the bulk of the abuse on this trip! Our lesson for this day, know what ALL of your alarms sound like. It was a chilly night in Evanston, so we let Gizmo snuggle in with us. We woke up to frost on the windshields of both vehicles. We were under way early with plans to make it to Winnemucca, NV for the night. This day was our best travel day so far. No issues with the RV or car and the scenery was fantastic. The drive down into Salt Lake was 10 miles of down hill. John is very happy that the RV has an engine retarder to help with this. The ride was down through a very scenic canyon. I was a little worried about the ride through Salt Lake but it was not too bad. The GPS routed us around all the traffic. 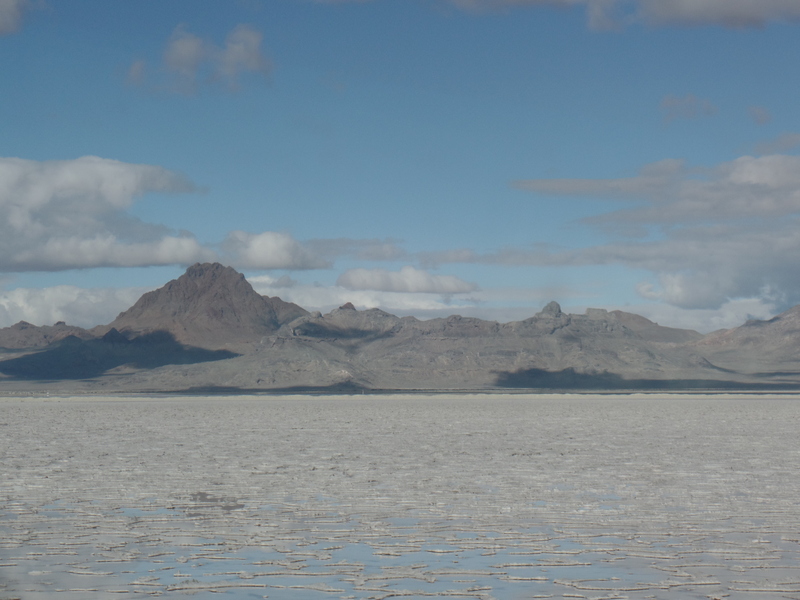 This is a beautiful area and we got to see a bit of Salt Lake as we drove by. I was not expecting much on the drive through Great Salt Lake desert but this ended up being one of my favorite parts of the drive so far. It looked like we were driving by miles of beaches with mountains off in the distance. We drove over 450 miles on Tuesday through some of the best scenery so far. The roads were great and uncrowded. We spent the day climbing and descending mountain passes. We both thoroughly enjoyed it. The plan for the night was another Passport America campground. The app listed the campground as $32 per night and with our 1/2 price discount it would be $16. We were happy to have full hook ups and the opportunity to stretch out the slides. When we arrived at New Frontier RV park we were very impressed. It is a brand new campground. We checked in with our Passport America discount and they told us the price would be $9.25 for the night for a back-in. John was feeling pretty tired after 2 big travel days and really wanted a pull through. The price for that with the Good Sam’s discount was just $19 so we sprung for the extra. This is by far the best campground we have been at yet. The sites are level, the park is immaculate. The biggest perk is the showers. They are beautiful, huge, tiled and with plenty of hot water. This is a dream for campers who have been on the road for weeks. John and I decided that we could spend an extra night here since we had gained a day by traveling longer for the past 2 days. Today we are taking advantage of good wifi and a great campsite with full hook-ups. Our project for the day is to secure the license plate with something other than the duct tape we used on the day we pulled out of Decatur, Indiana. 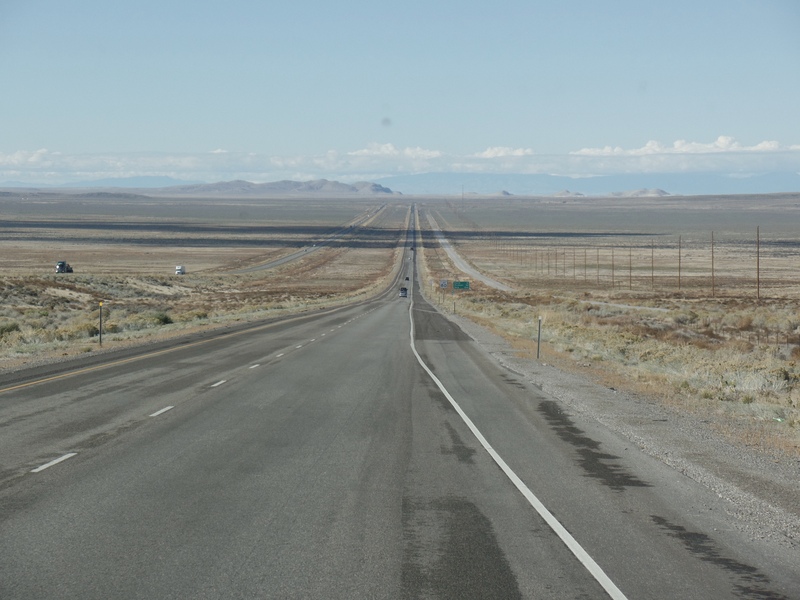 Tomorrow we are back on the road with plans to arrive at Lee Vining, CA. This will put us at the eastern side of the Tioga Pass road and the weather is looking favorable that this will remain open and we will be able to get into Yosemite via this route. This entry was posted in Lessons Learned the Hard Way, The journey west and tagged Garmin, Good Sams, New Frontier RV Park, passport america, Tioga Pass. Bookmark the permalink. 1 Response to What’s that sound? I was honored to have them stop into the Bureau of Land Management office in Winnemucca NV. I took a few pictures of Gizmo and petted him. Such a great pet and having a life full of adventures. Thank you for stoopping in and bewst of luck on your journeys.